When King Harold the Fair-haired, in 872 a.d., had united all the scattered earldoms of Norway under his own sway, he issued a stringent order forbidding pillaging within his kingdom under penalty of outlawry. The custom of sailing out into the world as a viking and plundering foreign lands, was held to be a most honorable one in those days; and every chieftain who wished to give his sons the advantages of "a liberal education" and foreign travel, strained his resources in order to equip them for such an expedition. But the Norwegians of the ninth century had as yet no national feeling; and they regarded King Harold's prohibition against plundering their own shores as absurd and arbitrary. Rollo or Rolf, the son of the king's best friend, Ragnvald, Earl of Moere, undertook to disregard the order. Coming home from a cruise in the Baltic and being short of provisions, he landed in the south of Norway and made havoc among the coast dwellers. The king, determined to make an end of the nefarious practice, kept his word and outlawed him. Rollo, being unequal to a struggle with the king, betook himself to the Hebrides, where a number of other Norse chieftains had sought a refuge from similar persecutions. His great strength and sagacity, no less than his distinguished birth, secured him a favorable reception and much influence. He was so tall that no Norwegian horse could carry him, for which reason he was compelled always to walk, and was surnamed Rollo the Ganger, or Walker. Though not formally recognized as chieftain, he seems gradually, by dint of his eminence, to have assumed command over the Norse exiles; and it was probably at his advice that they resolved to abandon the bleak and barren Hebrides, and seek a more congenial home in a sunnier clime. At all events a large expedition was fitted out and set sail for the south, early in the tenth century. It landed first in Holland, but finding that all-too-accessible country already devastated by other vikings, they proceeded to the coast of France and entered the mouth of the river Seine. Charles the Simple, a feeble, foolish, and good-natured man, was then king of France, but utterly unequal to the task of defending his territory against foreign invaders or domestic pretenders. The empire of Charlemagne had been broken up and divided among his grandsons; and the fraction which was to be France, was then confined between the Loire and the Meuse. Here was a golden opportunity for Rollo the Ganger and his vikings. Meeting with no formidable opposition, they sailed up the Seine and cast anchor at the town of Jumieges, five leagues from Rouen. This ancient city, which had suffered much from recent sieges and invasions, was in no condition to defend itself. It was of slight avail that the priests chanted in the churches, with the fervor of despair: "Deliver us, oh God, from the fury of Norsemen!" The vikings continued to pillage the surrounding territory, and were daily expected to sack the city. In this dire dilemma the Archbishop of Rouen offered himself as an ambassador to the pagans, in the hope that perhaps he might become an instrument in the hand of God to avert the impending doom. But if, as seemed more probable, martyrdom was in store for him, he was ready to face death without flinching. Rollo, however, who could honor courage even in an enemy, received him courteously, and after a brief negotiation pledged himself, in case the city surrendered, to take peaceful possession of it and to molest no one. This pledge he kept to the letter. His ships sailed up the river, and the tall chieftain, at the head of his band of yellow-haired warriors, made his entry into Rouen, without a sword being drawn or a torch lighted. He inspected the fortifications, the water supply, and all points of strategic interest, and finding everything tolerably satisfactory, resolved to remain. Making Rouen his headquarters and base of supplies, the Norsemen made expeditions up the Seine and established a great fortified camp near the confluence of the Seine and the Eure. Hither a French army, under the command of Regnault, Duke of France, was sent to drive them out of the country. But before risking a battle Regnault chose to negotiate. He sent a certain Hasting, Count of Chartres, to Rollo in order to find out what was the aim and object of his invasion. This Hasting was himself a Norseman, and had, twenty years before, proved himself so formidable a foe, that the King of France had been compelled to buy his friendship by a concession of land and a noble title, in return for which favors Hasting had become a Christian and a vassal to the king. It was doubtful, perhaps, if this man, even though he may have acted in good faith, was the best ambassador to his countrymen. For he was himself a living example of what might be gained by audacity and a shrewd use of one's advantages. Rollo the Ganger attacks Paris. "Gallant soldiers!" shouted Hasting, from afar, "what is your chieftain's name?" "We have no lord over us," they replied; "we are all equal." "For what purpose have you come to France?" "To drive out the people who are here, or make them our subjects, and win for ourselves a new country. But who are you? How is it that you speak our tongue?" "You know the story of Hasting," the count made answer; "Hasting, the great viking, who scoured the seas with his multitude of ships, and did so much damage in this kingdom?" "Ay, we have heard of that; but Hasting has made a bad end to so good a beginning." "Will you submit to King Charles?" was the ambassador's next query. "Will you give your faith and service, and receive from him gifts and honor?" "No, no," they cried back; "we will not submit to King Charles. Go back and tell him so, you messenger, and say that we claim the rule and dominion of whatever we win by our own strength and our swords." Hasting lost no time in communicating this message to the French and in urging a compromise. But Regnault called him a traitor, and would have none of his advice. 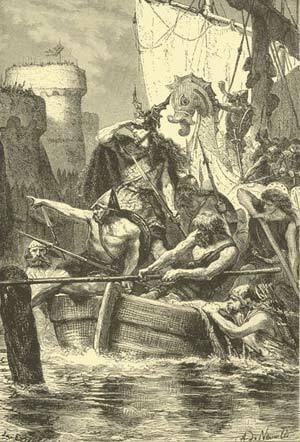 He promptly attacked Rollo and his Norsemen, but suffered an overwhelming defeat. His army was cut to pieces, and he himself slain by a fisherman of Rouen who had attached himself to the invading force. Rollo followed up his victory by sailing up the river and laying siege to Paris; but the capital of France proved too strong for him and he had to retire to Rouen, whence he continued to havoc the surrounding country. He conquered the city of Bayeux and slew its ruler, Count Berenger, whose beautiful daughter, Popa, he married. Instead of organizing mere plundering expeditions, Rollo gradually changed his tactics and took permanent possession of the towns that fell into his hands. The peasants, too, who lived in the open country, found that it was their best policy to seek his friendship and pay him tribute, rather than rely upon the uncertain protection of the King of France. They had discovered before this that Rollo was a man whose word could be trusted--a lord of mighty will, who had a ruthless way of enforcing obedience, but was open-handed and generous withal to those who would serve his purposes. It could no longer be said with truth, as the vikings had said to Hasting, that they had no lord over them. Rollo, whose chieftainship had hitherto been based upon his genius for ruling, was now formally chosen king--a title which he later exchanged for that of Duke of Normandy. In Norway, previous to the conquests of Harold the Fair-haired, each province had had its king, who was not always hereditary, but was often chosen by the peasants themselves, because he possessed the qualities required of a leader. It was in accordance with the same custom that they now conferred kingship upon Rollo, whose valor, sagacity, and firmness of purpose had been amply proven. It was the power of the man--the weight and force of his personality--which they respected, no less than his clear-sightedness, his readiness of resource, and his skill in the rude statecraft of his age. Encouraged by his previous successes, Rollo now made larger plans, and with the view to carrying them out, formed an alliance with some Danish vikings who had managed to effect a lodgement and maintain themselves for some years at the mouth of the Loire. Together they started upon an extensive campaign, the objective point of which was again Paris. But the powerful fortifications baffled the Norsemen, who possessed no machinery of destruction fit to cope with such defences. The siege had therefore to be abandoned. Dijon and Chartres also made a successful resistance. But a long chain of smaller cities surrendered, and the country was ravaged far and wide. The peasants took to the woods and refused to sow their fields, knowing that there was small chance of their reaping them. So desperate became the situation that nobles and peasants alike entreated the king to make peace with the Norsemen on whatever terms he could procure. The king was not unwilling to listen to such prayers. It occurred to him that in making a treaty with Rollo he would be killing two birds with one stone. He would not only be ridding France of a dangerous foe, but he might secure for himself a powerful friend who might help him keep the unruly nobles in order, and secure him in the possession of his shorn and reduced kingdom. With this end in view he invested Rollo with the sovereignty of his northern province, named after the Norsemen, Normandy, and conferred upon him the title of duke (912 a.d.). Rollo was to recognize Charles as his overlord, and defend him against external and internal foes; and he was to become a Christian and marry the king's daughter, Gisla. It is told, however, that when Rollo was required to kneel down and kiss the royal foot in token of fealty, he stoutly refused. "I will never bend my knee before any man," he said, "nor will I kiss anyone's foot." After much persuasion however, he permitted one of his men to perform the act of homage in his stead. His proxy stalked sullenly forward, and pausing before the king, who was on horseback, seized his foot and raised it to his lips. By this manoeuvre, the king came to make a somersault, at which there followed a great and disrespectful burst of laughter from the Norsemen. Shortly after the conclusion of this treaty Rollo was baptized, and his marriage to the Princess Gisla was celebrated with great pomp in the city of Rouen. His previous marriage to Popa does not seem to have caused him any scruple, though, as a matter of fact, he continued to regard the latter as his wife, and when Gisla died he resumed his marital relations with her, if indeed they had ever been interrupted. The princess had been to him nothing but a hostage from the king and a pledge of his good faith. But Popa, who was the mother of his son William, surnamed Longsword, he loved, and we do not hear that the fact that he had killed her father caused any serious trouble between them. As Duke of Normandy, Rollo exhibited a political insight and a genius for administration which in those turbulent days was certainly remarkable. He had the true welfare of his people at heart, and with a firm hand he maintained justice, protecting the weak, and restraining the strong. The laws which he made he enforced with stern impartiality, and no man could plead birth or privilege before him, if he wantonly offended. The farmers were Rollo's special care; for warrior though he was, he well knew that war is destructive, and that the prosperity of a land must be founded upon productive labor. The peasantry of Normandy were not slow to discover that they were better off under their new ruler than they ever had been under the old; and they rewarded Rollo with a sincere loyalty and devotion. Their confidence in his power to right wrong, became in the course of time half superstitious; and if any of them was in peril or suffered at the hands of his enemy, it became the fashion to shout: "Ha, Rou!" --Rou being a corruption of Raoul, the French form of Rolf or Rollo. Then it was the duty of everyone who heard this cry, to hasten to the aid of the sufferer or to pursue his assailant. It has been asserted that our "hurrah" is derived from this Norman shout, but I hold this to be more than doubtful. That Normandy was prosperous under the reign of Rollo, and that its people were contented, seems, however, to be well established. According to the legend, so great was the public security that property left on the highway could be found untouched after days and weeks; the farmer left his implements in the field without fear of losing them; and theft and robbery became comparatively rare. In a great measure this was, no doubt, due to the strict organization which Rollo introduced, and his insistence upon the personal accountability of each one of his subjects to himself. For he had learned one most important lesson from his enemy, Harold the Fair-haired. This king was the first to establish in Europe what is called the feudal system of land-tenure. He declared all land to be the property of the crown, and merely held in fief by the nominal owners. In recognition of the king's proprietorship, the latter, therefore, pledged themselves to pay a certain tribute, and to support the king in case of war, with a given number of armed men, in accordance with the size and value of their holdings. This same system Rollo is said to have introduced into Normandy, whence it spread over all Europe. Though we have now no more use for it, it proved a great and important element in the progress of civilization. Rollo the Ganger must have been nearly eighty years old when he died in 927. His son, William Longsword, who succeeded him as Duke of Normandy, was a man of gentler disposition and in vigor and sagacity inferior to his father. Rollo's descendant in the fifth generation was William the Conqueror, who inherited in a larger measure the qualities of his great ancestor.